Will the Body Diversity of NXT's Women Make It to the Main Roster? I’ve been thinking about the radical body diversity amongst the NXT women’s roster ever since NXT Takeover Chicago in May in which Nikki Cross and Ruby Riot met Asuka in a triple threat for the NXT Women’s Championship. Though NXT has long provided a platform for women wrestlers who often defy the old Diva aesthetic that long defined the main roster, the current crop squarely places focus on what their bodies can do rather than how pleasing they are to the eye. That’s not to say that NXT’s female employees aren’t conventionally attractive; unfortunately success for women in sports entertainment still largely hinges on this. After all, NXT currently hosts the Iconic Duo, Billie Kay and Peyton Royce, whose combination of intimidating beauty and mean girl cool viscerally transports me back to high school. But watching the four women who have dominated the NXT Women’s Championship scene in recent months—Asuka, Ember Moon, Cross and Riot—it’s striking how much they look like regular women many of us might know, whether they be our friends, partners, family members or who we see when we look in the mirror. The women of NXT are pioneering a different kind of body aesthetic that focuses more on the devastation they can bring rather than how they look. 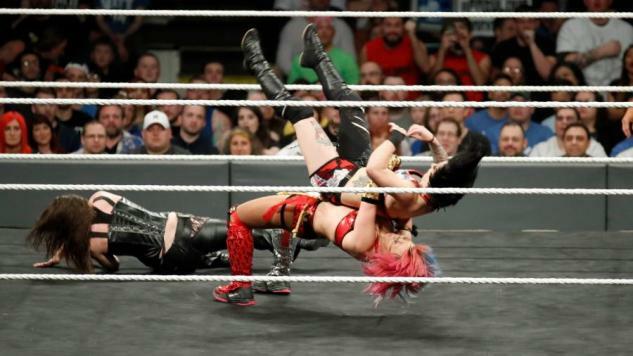 For example, none of the three competitors in the aforementioned Women’s Championship match in Chicago have defined abs or glutes, but the focus of the match was on how far these women could kick each other into oblivion. Elsewhere on the roster, Lacey Evans’s military-trained body extends out of her 1940s-cut ring gear to subvert the body ideals of the time, while Sonya Deville is defying not only body norms but sexual orientation in WWE. This is in contrast to the female bodies on the main roster, which still largely subscribe to the figures cut by many of the “Divas” and models who came before. Not to undercut any of their talent, but the “Women’s Revolution” hasn’t entirely discarded the company’s long-held beliefs of what women wrestlers should look like. There’s been an obvious shift in the types of wrestlers now sought for NXT and, eventually, WWE, compared to just a few years ago. This was plain to see in the Parade of Champions for the Mae Young Classic earlier in July. While I would have liked to see more black women in the tournament, it displayed arguably the biggest racial diversity WWE has seen amongst its women wrestlers in a long time, with the likes of Jazzy Gabert (also known as Alpha Female), Piper Niven (Viper), Sage Beckett (Rosie LottaLove), Nicole Savoy and Shayna Baszler representing a range of body types, as well. As refreshing as NXT and the Mae Young Classic’s rosters have been, it’s worrisome to see what could await these women when they hit the main roster. Nia Jax, who perhaps most forcefully rejects these stereotypes, is routinely met with fat-shaming jeers both online and IRL. And when women wrestlers are the victims of crime, such as Paige and Charlotte, who were targeted in hacks of their private photos and videos, their bodies and actions are picked apart. If wrestling barely knows what to do with cisgender women who step outside the lines society and the industry have drawn, both in terms of how they look and what they do with their lives, the outlook is bleak for the inclusion of trans, non-binary and disabled wrestlers and their fans. Slowly but surely, with a gait that resembles one step forward, two steps back, WWE is realizing that women wrestlers come in all different packages. Hopefully the trends shown in NXT and the Mae Young Classic will prosper on Raw and Smackdown, with a roster that focuses on utilitarianism and not the consumption they’ve tried to sell us for the better part of twenty years. Scarlett Harris is an Australian writer. You can read her previously published work at her website The Scarlett Woman, and follow her on Twitter at @ScarlettEHarris.